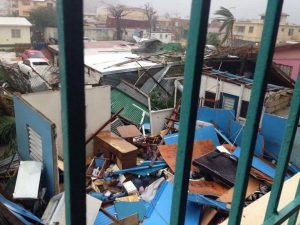 Guyana on Thursday said it was intensifying efforts to coordinate relief for Guyanese nationals affected by Hurricane Irma in a number of Caribbean islands, particularly St Maarten and British Virgin Islands which both suffered serious devastation following the passing of the Category 5 hurricane. Chairman of the Ministerial Task Force on the Caribbean Disaster, Prime Minister Moses Nagamootoo along with Minister of Citizenship Winston Felix who is also a member of the task force, Thursday held a consultation with the Civil Defence Commission (CDC), the Ministry of Foreign Affairs and Major General (Rtd) Joe Singh (who is acting on behalf of Minister of State Joseph Harmon who is currently out of the jurisdiction) and other officials. Col. (Rtd) Chabilall Ramsarup, Director General of the CDC, briefed the Task Force on the initial plans for Guyana’s response, following a briefing from the Ministry of Foreign Affairs officials relating to the situation faced by Guyanese nationals in the various islands. Following the three-hour long meeting it was decided that Minister Felix will head a Guyana Needs Assessment Team that will travel to Tortola in the British Virgin Islands and St Maarten via Antigua to conduct an initial assessment of the needs of Guyanese nationals on the islands and report to the Ministerial Task Force which was appointed by His Excellency President David Granger to coordinate Guyana’s efforts through the CDC. The visit by the fact-finding mission comes at a time when telecommunication voice and data services are crawling back to normalcy for some subscribers. Foreign Affairs Minister, Carl Greenidge said Guyana’s Honorary Consul to St.Maarten, Cleavland Beresford’s home has been badly damaged and he has suffered significant losses. The Guyana government has already said it could not actively consider evacuating Guyanese unless it has concrete information. The Task Force also includes Carl Greenidge, Minister Harmon, Minister of Finance Winston Jordan, Minister of Public Infrastructure David Patterson, Minister of Public Affairs, Dawn Hastings-Williams and Minister of Public Service Dr. Rupert Roopnaraine. The Guyana Needs Assessment Team will comprise officials from the Department of Citizenship, the Ministry of Foreign Affairs and the CDC. The Government of Guyana has also decided to double the initial contribution towards relief efforts from US$50,000 to US$100,000. Prime Minister Nagamootoo expressed deep concern for the welfare of Guyanese, particularly in Tortola and surrounding islands, Virgin Gorda, Anegada and Jost Van Dyke and expressed relief at reports that Guyanese who were evacuated from Barbuda to Antigua are being accommodated by relatives and friends on the main island there. The Guyana Needs Assessment Team is tentatively scheduled to depart Guyana on Saturday, September 16th and return after conducting assessments in Tortola and St Maarten.